Time for the first review of 2016! We’re kicking off the year with a massive semitrailer car transporter. 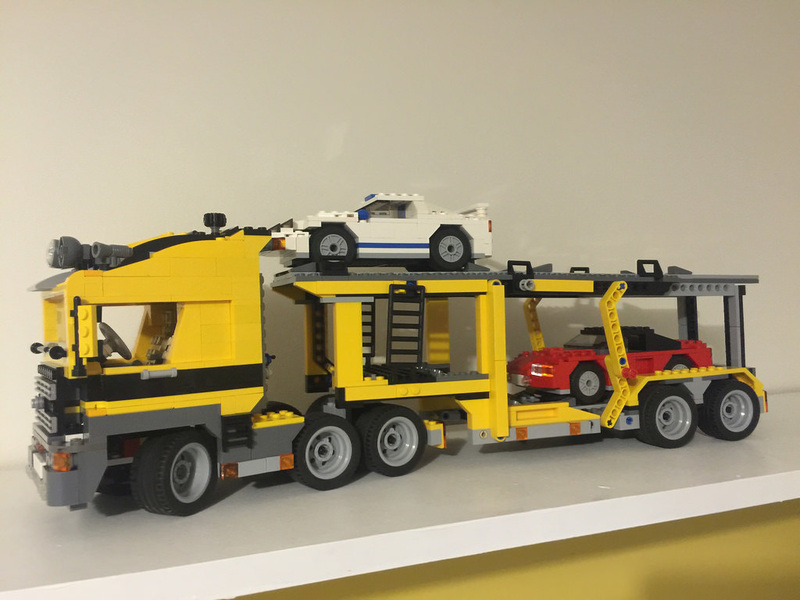 The first set off the bulk list for a full review is a big truck and two cars. 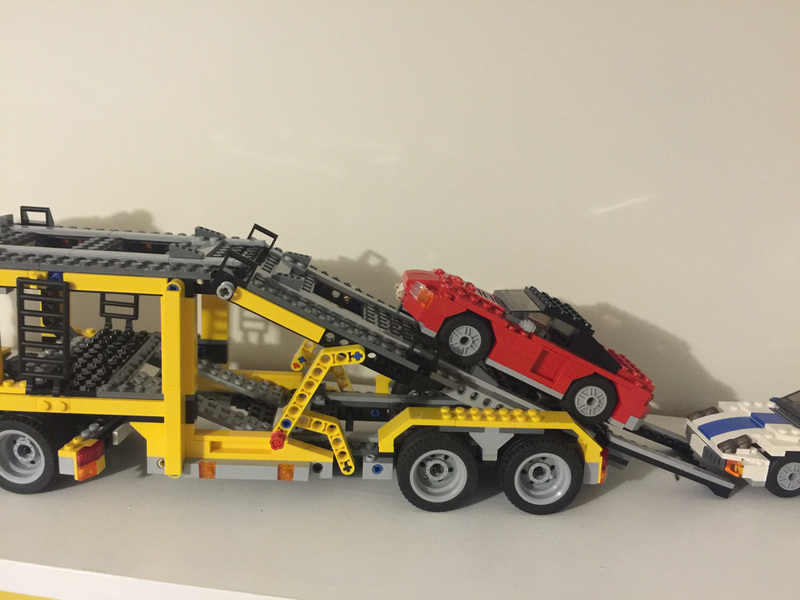 This set is also a multibuild, with a large crane and a tow truck able to be built. 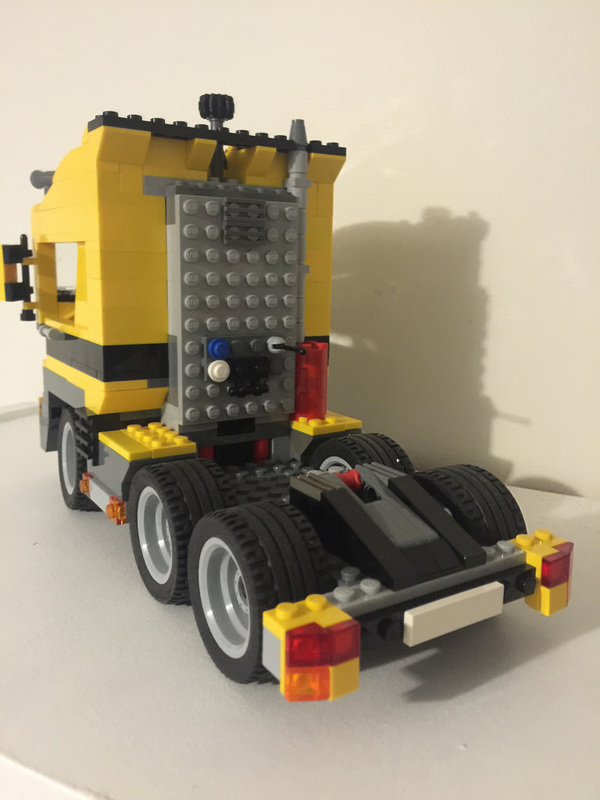 I haven’t built them, so this will just be based on the primary build of the car transport truck. The elements in this set are pretty great. With lots of yellow pieces, it’s very eye catching, and there are also a few that are still considered a rarity. The 2x5x1 windscreens in bright yellow are used cleverly as wheel arches, and you get four of them. It’s still the only set to have them in this colour. There are a fair few different varieties of bow bricks, including the 1×4 brick with bow in bright blue, used on the white car, and the 2×2 bow brick with two studs. While the one I built didn’t have these, it was still considered a good addition, as they only appear in four sets. Alongside these, you’ll find a lot of Technic beams, plates, and a very nice assortment of wheels and tyres. While the truck is so big it has few other vehicles to swoosh with it, the set is brilliant for driving around the floor. It’s got front steering, and the trailer can detach, sit by itself, with the back opening up so the cars can access both levels. It’s a brilliant model that is lots of fun driving around. While the one I put together had a few parts missing, it’s still a great set to build, and you soon realise just how big the vehicle is when the first car is built. You start with the red car. It’s not the normal way I would have built a car, but it’s great, and looks really nice. 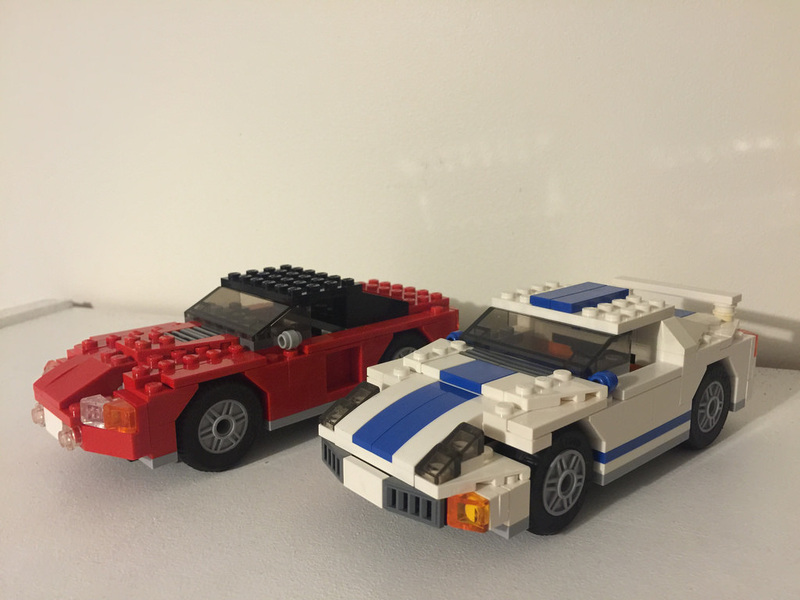 It’s finally a car from LEGO that has the proportions pretty close to right. The tyres might be a little too small, but it’s not too bad as a whole, plus it fits nice and snug in the trailer. The next thing to build is the truck itself. The chassis ends up being really big, and gives you a great idea of the size of the completed model. I was missing a few parts at the front, so it looks a little weird, but it’s not too bad. The steering mechanism is simple, but very sturdy. A great feature of the cab is that the roof is removable, and not even held in with any studs. 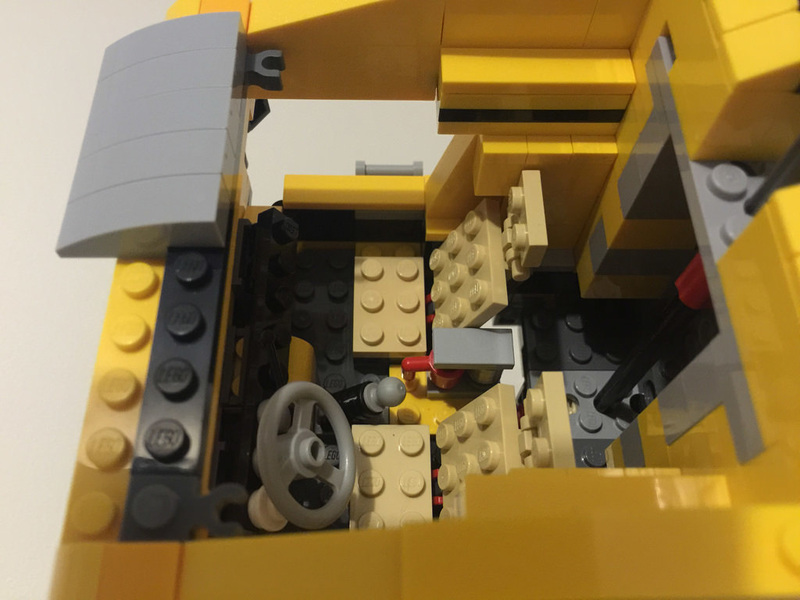 It’s a snug fit that looks great, and the truck could possibly fit the Technic minifigures. It would be a tight fit though, and the cars would look ridiculously small. After the white vehicle is built, it’s on to the main attraction to me, the trailer. The base is created, with the section that sits above the connector built separately, then added on later. To complete it, the back half of the top layer is clipped on. 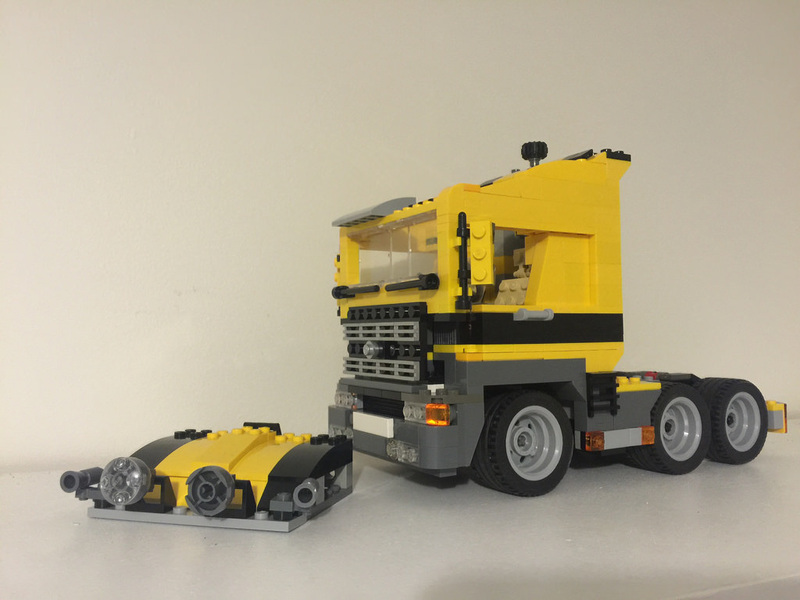 The build as a whole is very strong, and uses some Technic elements, as well as some SNOT to get the front of the cab sorted, as well as the rear wall. It’s not overly complicated, and would definitely be suitable for pre-teens. The look of this set is fantastic. It’s big, bright yellow, and includes lots of great details that would be seen on any highway transport vehicle on the roads. I’m very impressed with this model, and couldn’t wait to show my wife when it was completed. 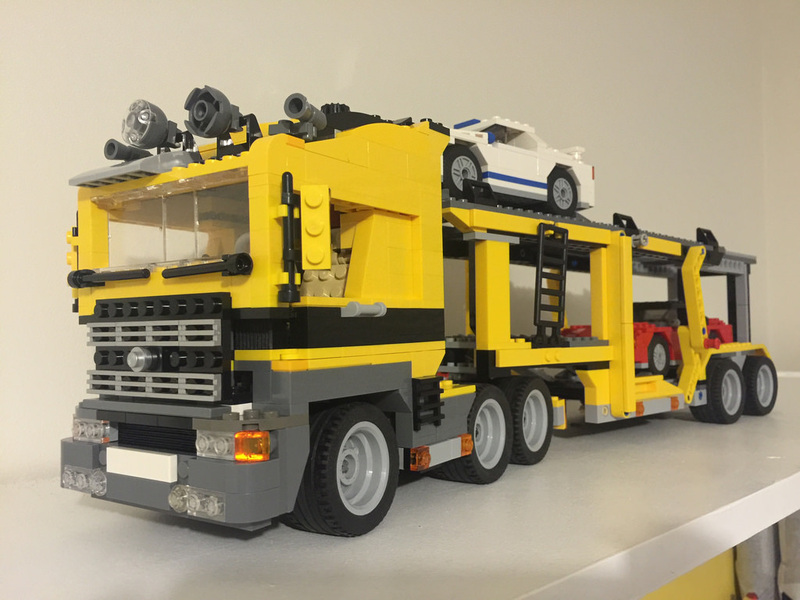 This set made me think of a little mate of mine who’s recently built the little version of this, 60060: Auto Transporter. This one just blows it out of the water, and I reckon he’d flip out with excitement! It’s a great set to build and display. Nothing makes it really stand out in particular, except for just being plain cool. Next week I’ll be reviewing a Juniors set I found in the bulk lot – 4858: Doc Ock’s Crime Spree from 2004. It’s a bit different!